Located in the heart of Downtown Toronto between the SkyDome and the Metro Toronto Convention Centre on Front Street, just north of Bremner Blvd. Near the top, a 24 sq. metre glass floor allows visitors to watch the streets under their feet. 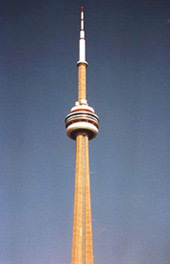 The CN Tower is the world's tallest building as well as Canada's most recognizable icon. At a height of 553.33m (1,815 ft., 5 inches), the tower is the centre of tourism in Toronto. With a chance to see the breathtaking view of downtown Toronto, the CN tower attracts approximately 2 million visitors each year. Things to do in the tower include walking on glass floor, eating over 1000 ft above ground at the revolving 360 Restaurant, watching a movie about the construction of the CN tower and of course enjoying the view. Thickness of The Glass Floor: 2 1/2 ". Layers, from the top down: * 3/16" scuff plate (replaced annually) * Two 1/2" layers of clear tempered glass, laminated together * A one inch layer of air (for insulation) * Two 1/4" layers of clear tempered glass, laminated together * Size of each panel: 42" by 50" * Load tests are performed annually on each panel to ensure safety.